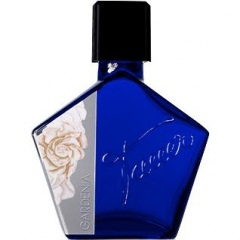 Sotto la Luna - Gardenia is a perfume by Tauer Perfumes for women and was released in 2014. The scent is floral-sweet. The longevity is above-average. It is still in production. In the early morning a tender gardenia bud begins to open slowly. It exudes a floral fragrance with a hint of green. In the course of the morning the flower opens to its full splendour. It exudes a strong floral scent accompanied by a light cream and soft powder, also a slight prizzeln as of sherbet powder as well as a slight hint of soap. Towards evening the flower loses its radiance. The first signs of fading appear. But she gives it all again. Now a hint of sweetness joins in, an idea of sweetness accompanies the flower as the moon wanders across the starry sky. The next morning she hangs powerlessly from the bush. But next to her a bud begins to open slowly. I can't explicitly sniff out jasmine and rose. I think they support the scent of flowers at different times of the day. I attribute the delicate powder to the rose, the cream more to the sandalwood from the base. It never gets really woody on my wrist in the finish and also vanilla and tonka bean I would not be able to name, they give in my opinion this light sweetness, which strengthens the flower scent at night and accompanies the fading in the course of the night. The soup herb association mentioned below I can understand for a short time in bloom. The durability is above average with 12 - 13 hours. The slope is clear at the beginning, weakens, but never becomes mealy. I would like to thank Angelliese for the test opportunity. There are generally two challenges to making a gardenia perfume. The first is that it requires a complete fabrication since the flower itself yields no aromatic essence. The second is balancing gardenia’s heady and sweet notes with its fleshy, salty, umami underbelly. Another hurdle, though, is matching the specificity of the appearance of the flower and its scent. There are a lot of things in this world that smell like a rose, jasmine or lemon. Nothing else smells like a gardenia, and so for those who can see, the fragrance and the look of the flower are intertwined. If in re-creating the scent of a gardenia the visual image isn't also summoned, then the representation is incomplete. Bolstering the association between scent and the visual appearance of the flower, and therefore adding to this challenge, is the way the look of the flower and its fragrance suggest each other. The creaminess of the scent matches exactly the matte texture and luminosity of the petal. The creepy, fleshy quality of the aroma is enhanced by the flower’s likeness to cyanotic or vampiric skin. The hint of blue color to the creamy white matches the cool, liquid quality of the aroma. Gardenia has a visual/olfactory mirroring similar to the way sound and meaning echo each other in onomatopoeia. Tauer clears the first two challenges easily. The top notes of gardenia smell like a particular slice of the scent of a gardenia. It is an abstraction, as any attempt at re-creating a gardenia will be. The success here is in the point of view. It is a perfectly proportioned sketch of the flower, not a photorealistic image. It stimulates your imagination, and engages you to complete the image for yourself. As for the umami, Tauer gives us a dusty mushroom, one that suggests that dank dark place where a mushroom grows as much as a mushroom itself. As for the challenge of the sensory mirroring, Tauer shines. The scent of Sotto di Luna Gardenia is like a gardenia under a black light. The aroma suggests spiced cream, a cool touch, a bone marrow blue-tinted white. Over time the specific appearance of a gardenia goes away but the shape holds. The precise abstraction remains, and the surface tension between sweetness and meatiness, creaminess and dustiness lasts through drydown. The gardenia itself is gone, but the angular lushness that characterize it remains. A wonderful 'morning after' scent. This Baby Sings The Blues.. I had to wear my sample several times, before I could write my review. I was so excited when this fragrance came out, and couldn't wait to receive my sample. I even put off purchasing my lovely LADDM, as I was afraid that I might fall in love with this one even more! First of all I want to say I gave this several tries, in different weather conditions etc. The opening is very green, bordering on bitter. A tightly closed green Gardenia bud, drifting in and out of a smokey background. This lasts a bit too long for my liking, and made me feel almost sad. When the middle notes finally turn up, they aren't able to overcome the greenness of the opening. The rose is very light, and I get a hint of jasmine, but stays firmly in the background. The base notes are the best thing about the whole structure of the fragrance. The dry down is very pleasant, and the Gardenia then becomes creamy, and sparkles. I feel the sandalwood and tonka bean sort of save the day for this fragrance. I am a huge fan of Andy Tauer fragrances, and I wanted to express my true feelings for this perfume, as I perhaps had put it on a huge pedestal before I had even tried it! My anticipation of having a great gardenia fragrance was bought down a notch. I feel many people will adore this scent, particularly, if you enjoy green fragrances, with a smokey vibe. This Gardenia certainly fits the bill, for Billie Holiday always wore this flower, while she sang the blues. Some of the notes are sad, and some lift your soul. Write the first Review for Sotto la Luna - Gardenia!